Driving towards Chew at 7.30am in the morning the rain was pouring down as it had been for the last few hours. There was flooding on roads where I hadn’t seen it before, with the land saturated with water then the extra amounts just poured from fields and lanes. I just made it through a couple of large floods on the way to Chewmagna. I arrived at the restaurant at 8am to meet my boat partner Andy. It was still pouring with rain that was slowly turning to snow and white area’s started to develop. 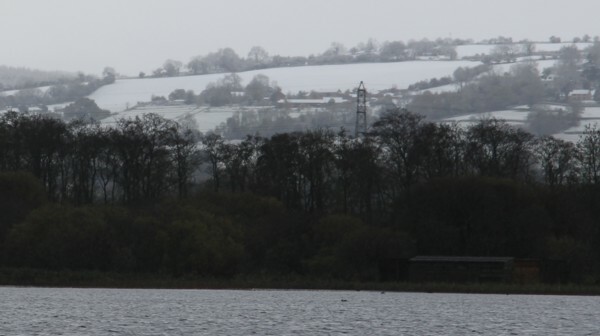 The Mendip hills were turning whiter by the minute. The breakfast was as normal very good and is a great start to the day, while the rangers prepare the boats for us. Soon boat 36 was ready for us to embark. Andy does a splendid job of providing most if not all of the tackle and equipment. Also he brings along this bloody great mud weight to help stabilize the boat and preventing it swinging about in the wind. After we had put the life jackets on we were storing all the gear in the boat. The weather looked to be breaking as we motored out to the first area. The snow had left it’s mark on the Mendips between 3-6 inches of it. We soon saw a few pike caught while we anchored up, and quickly we had 2 ourselves, only jacks though. One to dead baits and the other to a spoon. We moved around the area stopping for 1.5 hrs in each spot before moving along. It would appear that when we first stopped we would get some action then it would stop. Andy had a couple of trout too on the spoon the largest being about 5lbs. 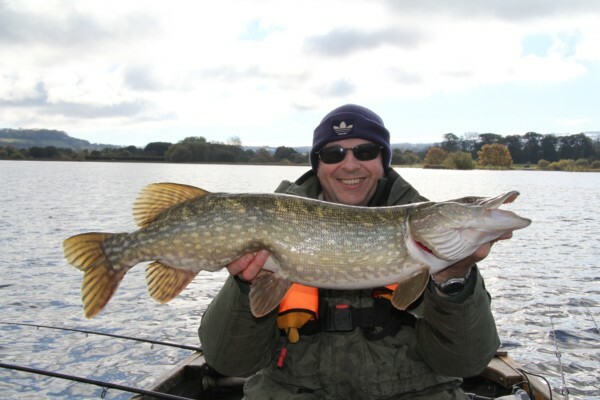 In total we had 5 pike with the largest going just over 10lbs so not too bad considering many blanked. This entry was posted on Monday, November 12th, 2012 at 7:53 pm	and is filed under Uncategorized. You can follow any responses to this entry through the RSS 2.0 feed. Both comments and pings are currently closed.